Overall I spent 2-weeks traveling from Varna, the northernmost city along the Bulgarian Black Sea, all the way down to Sozopol in the south. I worked my way along the coast using a variety of transportation methods, stopping along the way to see what each of five most popular beach towns have to offer. As the third largest city in Bulgaria and the biggest of the Bulgarian beach towns, Varna is considered the summer capital of the country. Not only does it have everything you’d expect from a modern seaside resort, but it’s also packed with history. Evidence from ancient Thrace, as well as the Greek, Roman, and Ottoman empires can be observed just while strolling around town. I absolutely loved Varna and easily could have spent much more time here. It’s explorable, with a great variety of activities to check-out, and has one of the best beaches along the coast. Definitely one of my favorite stops! Having just arrived in Bulgaria, my starting point was the capital city of Sofia in the west. Luckily, with these being two of the largest cities in the country, I had numerous transit options. Still, with this being a cross-country trip, expect to spend the day traveling unless you’re paying for a quick flight. In terms of bang for buck, the bus is the way to go. 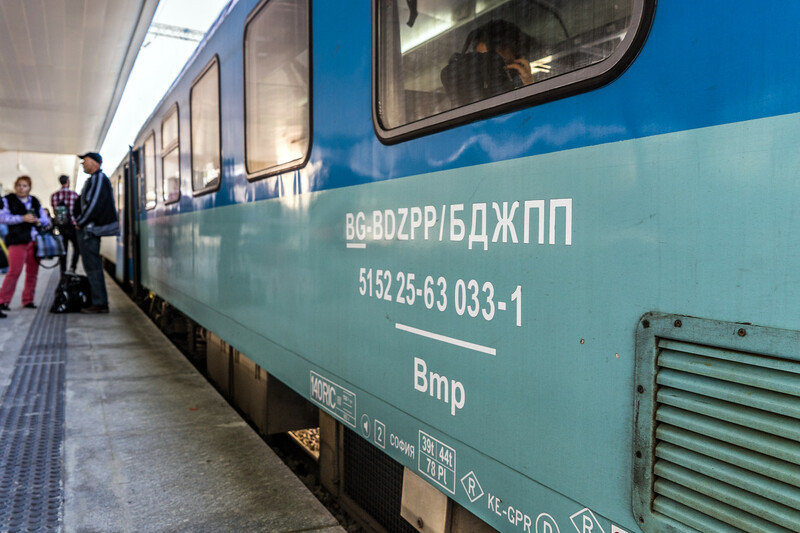 The 33 lev / $19 USD price is slightly more than the train, but the trip is only 6 hours, saving 30-90 minutes, and has the benefit of air conditioning. With Varna having one of the most popular Bulgarian beaches, there are always a ton of departures and arrivals spread throughout the day. This is the option that I went with and quickly regretted. Partway through the 8-hour trip, the hot sun and lack of AC had me and my 4 other cabin mates absolutely melting. For 30 levs / $17 USD it’s far from expensive, but the small savings you gain just isn’t worth it. 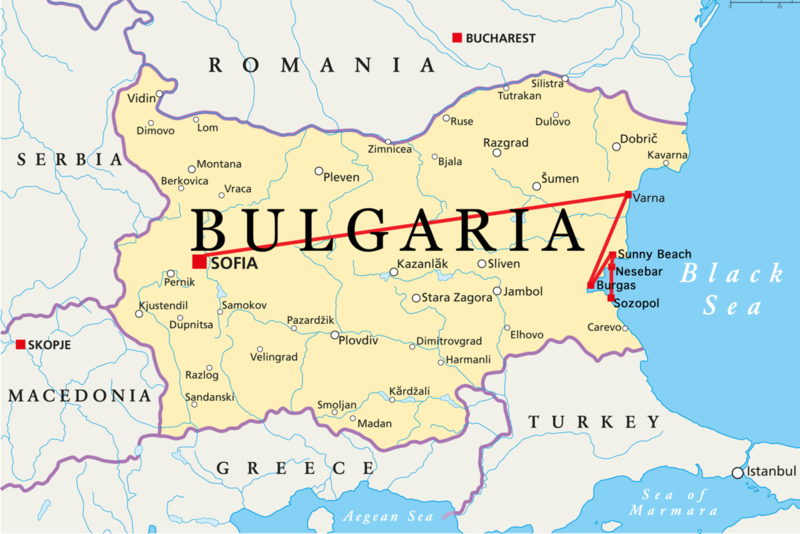 The quickest and most expensive option is flying into Varna International Airport, one of two along the Bulgarian coast. Available flights are extremely limited to only a handful of airlines and routes, so this option rarely makes sense. Expect to pay 65-100 levs / $37-$57 USD for a one-way ticket from Sofia. Exploring and relaxing on Varna’s beach is an absolute must. The sand is soft and white, the surf is mild, and it’s busy but never too crowded. After soaking up some sun, head on over to Cubo – one of the many beachside lounges that offer up tasty cocktails and quick bites. One of my favorite surprises while exploring these Bulgarian beach towns are the Sea Gardens. 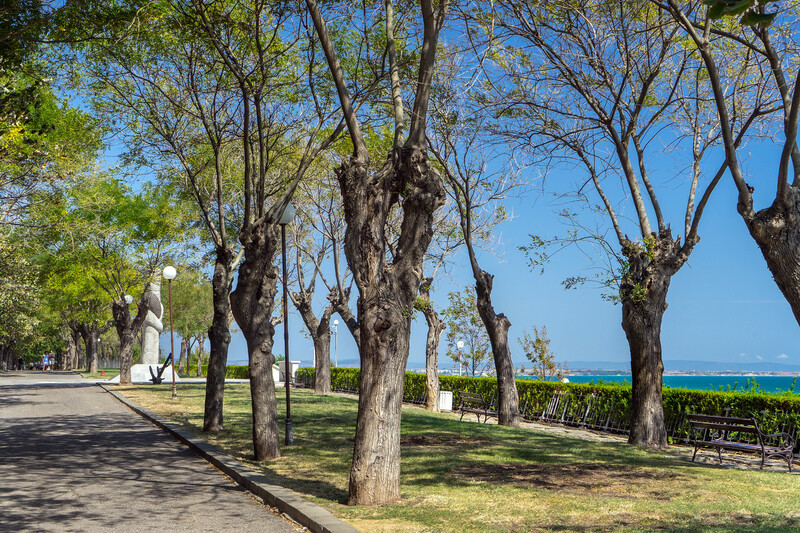 Separating the beaches of Varna and Burgas from the urban areas are long stretches of public park, where you can find restaurants, playgrounds, performance theaters, and plenty of shade. Of the two, Varna’s is easily the best. Not only can you find a zoo, an aquarium, and a skatepark, but also both the Naval History and Natural Science Museums. If you’re looking to continue diving deeper into history, the Varna Archaeological Museum should be at the top of your list. Over 100,000 artifacts spread throughout three separate exhibition halls are on display, dating as far back as 4,200 BCE. The museum also manages two archaeological sites which are open to the public – the large Roman baths in the city centre and the medieval Aladzha Monastery. Definitely make sure to stop by the Tourist Information Center and take part in the free 3-hour walking tour. Specific days depend on the time of year, so definitely check their website for the schedule. Tourism in Burgas isn’t anywhere near as developed as in the other Bulgarian beach destinations. Instead, it’s quite a bit more industrial, having both a massive sea port and one of largest oil refineries in southeastern Europe. Still, between the museums, galleries, and beach, there’s enough going on to keep you occupied for a day or two. 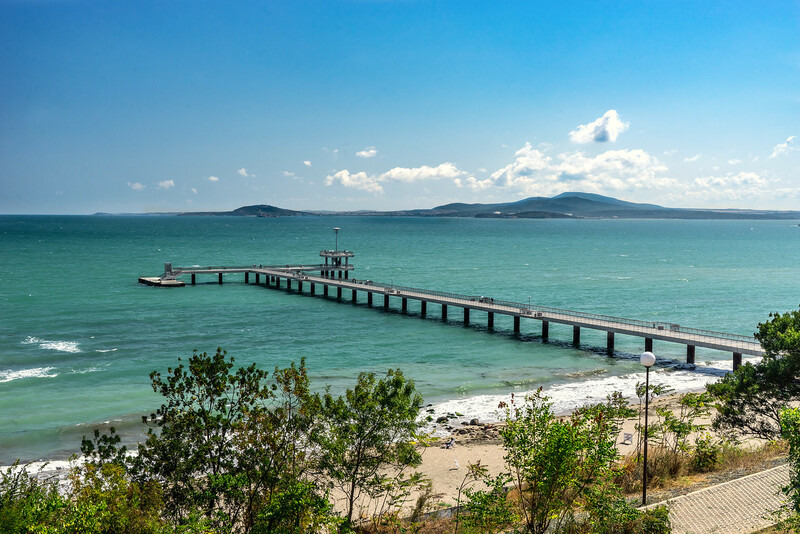 While I certainly found a few of its areas enjoyable, there’s no denying that Burgas lacks the charm of some of these other Bulgarian beach towns. Better to spend your time elsewhere, where you’ll get more bang for your buck. 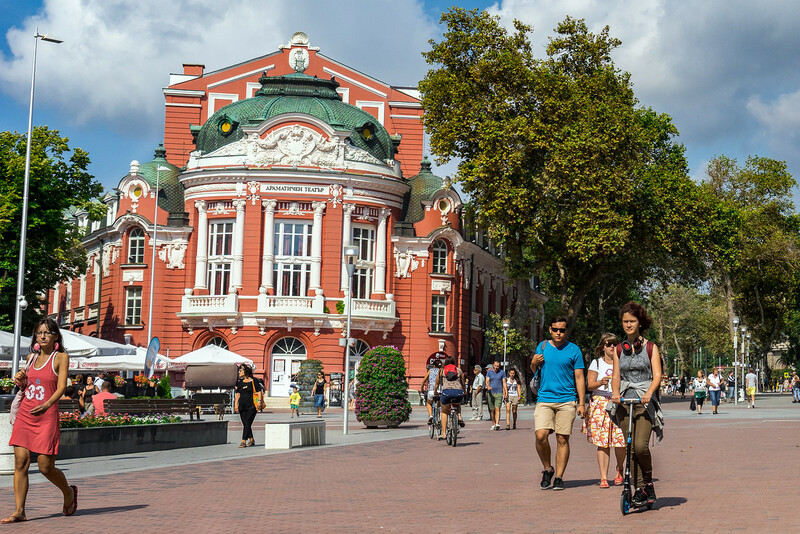 Because Burgas is one of the larger Bulgarian beach destinations along the Black Sea coast, you have a fair amount of local, domestic, and international transportation options. At only 14 levs / $8 USD for a two hour ride, the bus is still your best option. I traveled this way and found it to be a relatively quick and convenient route. Departures are every 45-90 minutes, so there is plenty of flexibility. Does 5 hours over 45 stops sound like your idea of good time? It’s technically the cheapest of these options, costing 10 levs / $6 USD, but the couple of extra bucks is totally worth spending to save the 3 long hours. I learned my lesson traveling from Sofia and pretty much avoided trains for the rest of my trip. Supposedly there was once a bookable 20 minute flight from Varna to Burgas. That’s more time spent boarding and taxiing than actually being in the air! Even though this short hop is no longer available, I’ve still included this as a transportation option because there are a handful of domestic and international flights from other locations. If you’re flying into any of the southern Bulgarian beach towns, this will be your hub. Burgas’ beach isn’t quite as nice as what you’ll find in Varna. The port is located at the southern end, so expect traffic from large barges to be a constant. This doesn’t mean that you can’t find beautiful stretches, especially up towards the Northern area. You just have to spend a bit more time searching it out. 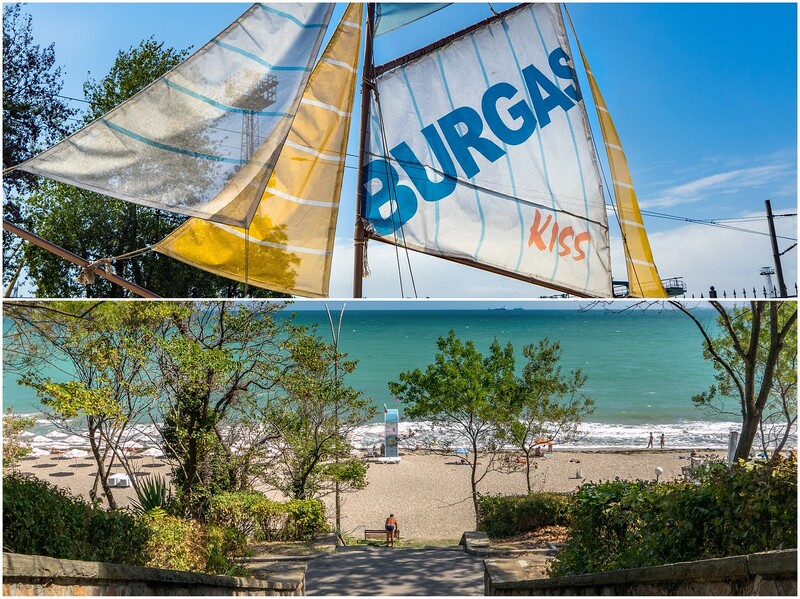 Along with better stretches of beach, the northern area of the Sea Garden also hosts the Burgas Sand Festival. Every year in July, artists from all over the world travel here to construct elaborate sand sculptures based on history and pop culture. I honestly didn’t think I’d be all that into this, but the complexity and scope of the completed pieces really were awesome. Well worth the 3.50 lev / $2 USD entrance fee. 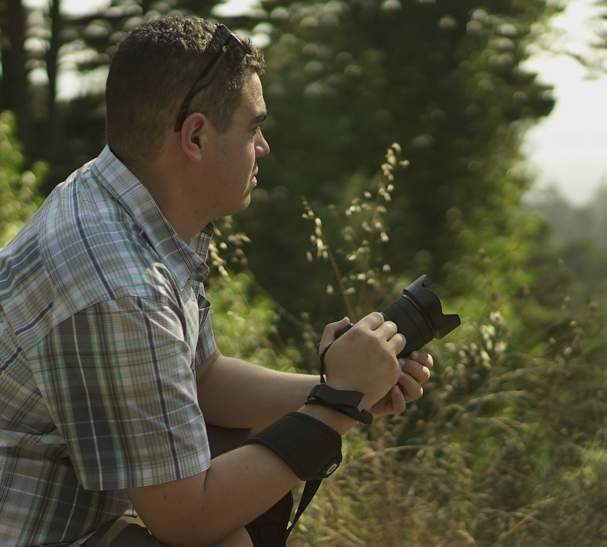 The Poda Nature Conservation Center is a protected part of Burgas’ wetland area and houses permanent displays dedicated to preserving the region’s biodiversity. The center also houses an eco-trail with bird-watching areas, an ornithological library, and an exhibition hall that holds temporary displays related to the center’s activities. While the other Bulgarian beach towns are known mostly for their beautiful waterfronts and ancient history, Sunny Beach is notorious for something else – its party scene. Think Phuket and Cancun all rolled into a small Eastern European town. By day, the endless themed resorts, beaches, and water parks are filled to the brim with families and sobering-up sightseers. Though once the sun sets, the streets become filled with cheap free-flowing alcohol and hard partying tourists. Sound like your idea of a good time? Then you’re sure to fit in perfectly with the thousands of other European tourists that visit over the summer months. I’ll be the first to admit that this definitely isn’t my scene, so I didn’t find Sunny Beach to offer all that much. After a couple of days I was more than ready to move on. Sunny Beach is around 20 miles north of Burgas, so the options really only consist of bus or taxi. If you’re traveling during the summer months, the buses run frequently and are cheap enough that it’s hard to justify any other public transportation method. 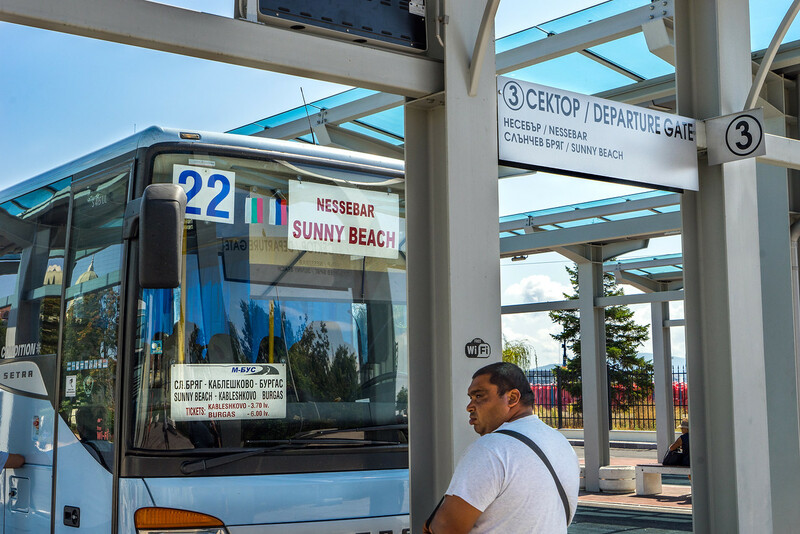 From May through September, busses from Burgas to Sunny Beach depart every 30-45 minutes and cost only 6 lev / $3 USD. Sunny Beach’s main stretch of beach is immense. 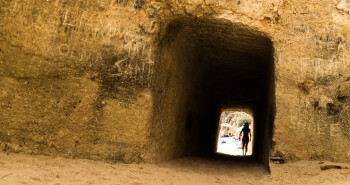 At over 3 miles long and up to 200 feet wide, there’s sand just about everywhere you look. Even with all this space, finding a free spot during the summer can be a challenge if you don’t arrive early enough. It’s just that crowded. Another problem to be aware of is the rampant beachside pickpocketing. As my host recommended, just leave all electronics and any valuables locked away at home. 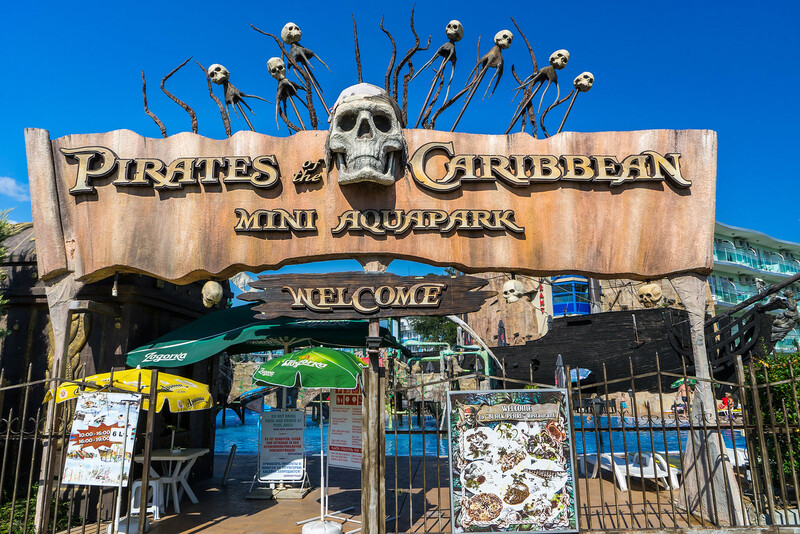 If wave pools and waterslides sound more like your idea of a good time, definitely check out Sunny Beach’s many aquaparks. Action Aquapark and Aqua Paradise are the two biggest, each costing around 40 lev / $22 USD per person for a day pass. When the sun eventually does set and you’re looking to get your drink on, it’s all about the bar crawl. For as little as 75 lev / $42 USD, you and a large group of partiers will be led around to venues all over Sunny Beach where you’ll find open bars, foam dance floors and plenty of loud music with neon lightsThere are a handful of different companies offering these crawls, but Party Crew! is supposedly the best of the best. 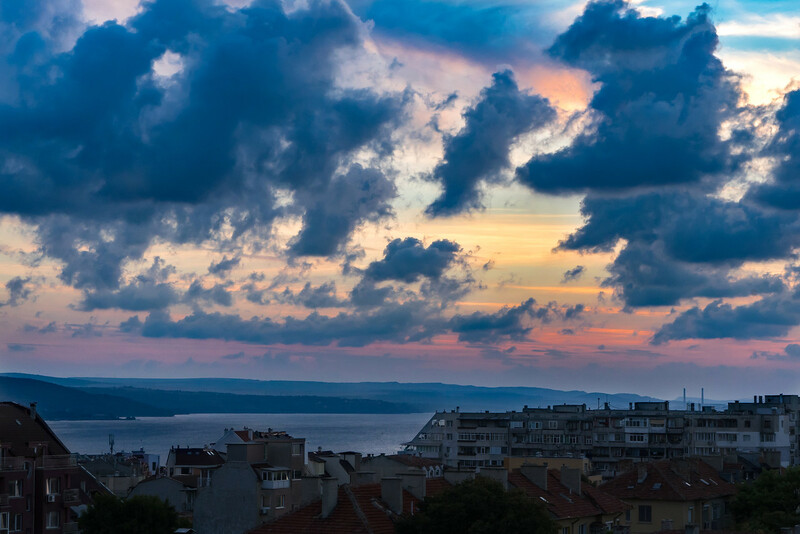 Located on a small peninsula just to the south of Sunny Beach, the ancient town of Nesebar is a breath of fresh air when compared to its hard-partying neighbor. 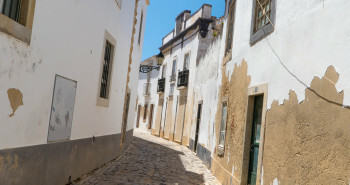 Here, it’s all about casually strolling through town and taking in the ancient seaside views. In fact, the variety of historic buildings on display is what prompted UNESCO to declare this a World Heritage site in 1983. The 3,000 years of occupation by a variety of different civilizations has created a harmonious tapestry of Thracian, Greek, and Byzantine architecture. I spent the day wandering around Nesebar and found this to be the perfect amount of time. 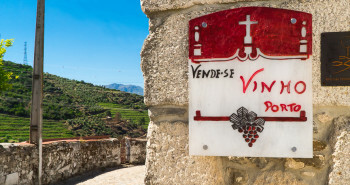 The town itself isn’t all that large, so you’ll have more than enough time to check-out all of the hotspots. At only around 3 miles south of Sunny Beach, getting to Nesebar is a cinch. Not only is it a quick and cheap Bus or Taxi ride away, but you can easily walk the mostly flat route if you’re comfortable with a bit of exercise. The 10 minute ride costs only 2 lev / $1 USD and will drop you directly at the entrance to Old Nesebar. If you’re looking to return to Sunny Beach, the pick-up spot is clearly labeled with both a sign and English lettering on the road. Most hotels have one or two go-to drivers and can easily arrange a trip to Nesebar for 5-10 lev. If that’s not an option, there are plenty of taxies on the street but you’ll need to be on your guard. Sunny Beach and Bulgaria in general are notorious for taxi scams that pray on unsuspecting foreign tourists. Before hopping in, always make sure to check for a price sheet in the window, that the fare is being metered, and that the driver knows exactly where you’re going. Sofia Guide has some great tips for avoiding taxi scams that also apply to all of these Bulgarian beach towns. 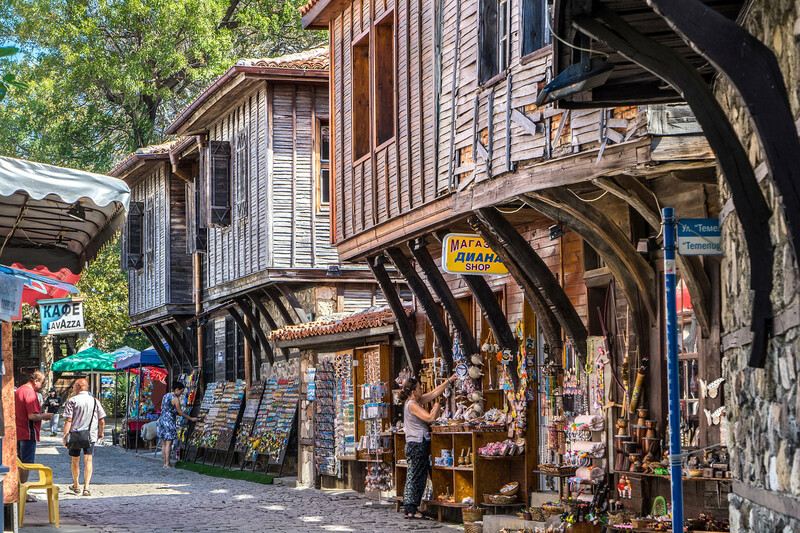 A visit to Nesebar is really all about enjoying both the history and atmosphere. Take the day to explore the stone walkways and multiple museums, such as the Archeological, Ethnographic, and ancient churches. If you’re looking to take out some of the guesswork, Viator and a few other tour agencies do offer paid walking tours. With Nesebar being the smallest of the Bulgarian beach towns on this list though, you’ll easily be able to see everything on your own with just the help of a good map. 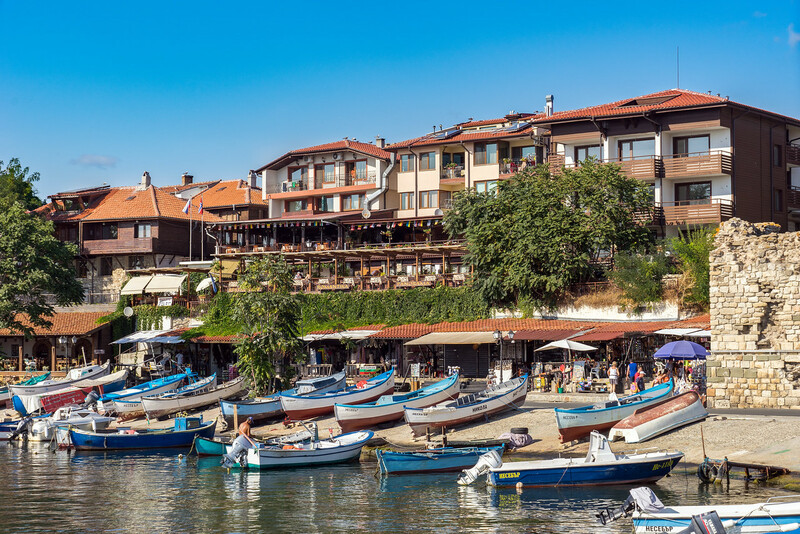 Having been established in 7th century BCE by Greek colonists, Sozopol is considered one of the oldest towns along the Bulgarian Black Sea coast. However, it’s thought to date back much further than that. Anchors from the second and first millennium BCE have been unearthed in Sozopol’s bay, leading historians to believe that it once operated as an active shipping port during ancient times. Sozopol ended up being my favorite of the Bulgarian beach towns. I love that there are two distinct experiences to be had with both the new and old towns. In the new town, modern restaurants, clubs, and boutique shops line the streets. The old town offers up non-stop historic charm, with traditional Bulgarian restaurants often looking out intimately over the Black Sea. It’s a great balance that allows you to easily mix-up whatever you’re in the mood for. Definitely a perfect end to my journey! With Sozopol being within the same coastal inlet as Burgas, Sunny Beach, and Nesebar, transportation options remain consistent. The bus remains your best option, however there’s also a ferry that travels to a few different locations depending on the time of year. Having already taken my fair share of bus trips, I wanted to give this ferry a try. A one-way ticket to Sozopol will set you back 27 lev / $15 USD, so it’s definitely not a budget option. It’s also not significantly faster than the bus. What benefit does the ferry offer? It’s technically the only direct public transportation option from Nesebar. The only downside of taking the bus from either Sunny Beach or Nesebar is that you’ll have to first travel to Burgas and then buy a separate ticket to Sozopol. Not that big of a deal, but it will add some additional layover time. The total cost will be about 9 lev / $5 USD for the hour and a half journey. Sozopol’s beach scene is broken up into a couple of different sections, both of which are easily walkable. Central beach is located just south of Old Sozopol and is the smallest of the two. It’s a great option if you’re staying nearby but can get brutally crowded, especially towards the end of the day. Harmani beach sits next to the new town and is a much better option during the peak summer months. No only is it more spacious, but you have much better variety of dining options nearby. 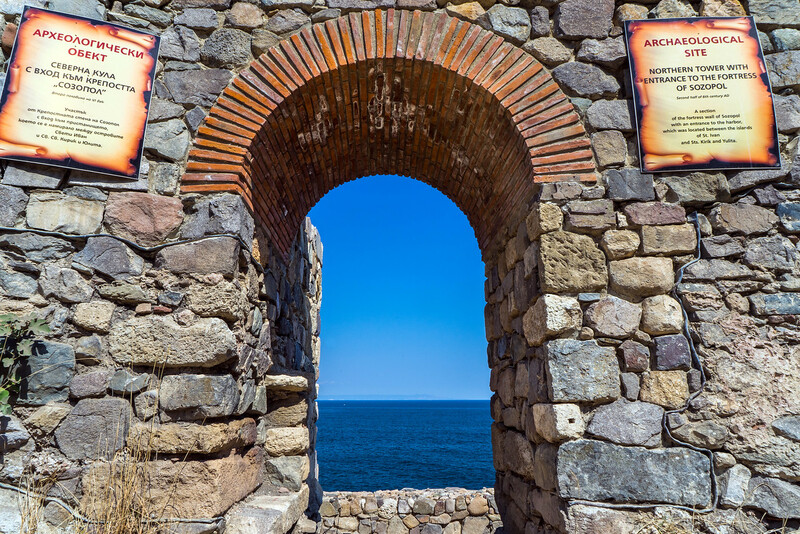 As one of the oldest Bulgarian beach towns, Old Sozopol has quite a bit of ancient history and architecture to explore. Start off with the Archeological museum and continue on through the five aging churches and monasteries spread along the coast. Even just walking though the old cobblestone streets, all with traditional Bulgarian wooden houses, is a beautiful experience. When dinner time finally rolls around, make sure to stop by one of the many incredible restaurants that look out over the Black Sea. Mehana Neptune, with it’s sweeping views and tasty traditional Bulgarian seafood, ended up being my favorite. Heading north to Burgas, you can catch one an hourly minibus for about 5 lev / $3 USD. Southbound has one every 3 hours that will take you as far as the Greek border. I needed to head back to Sofia so, rather than spending the entire day on a bus or train, I ended up flying from Burgas. To get to the airport, I reserved a private hotel transfer through SunTransfers for 60 lev / $34 USD. The entire trip was painless and I was able to get from my hotel in Sozopol to Sofia in about 3 hours. Don’t stop with just these Bulgarian beach towns! This barely even scratches the surface of the amazing places and experiences along the Black Sea coast. Continue further off the beaten path to the south with seaside villages such as Kiten and Primorsko. Or head north of Varna to the major family resort town of Golden Sands. Using this guide as a base to help you navigate around, you’re sure to find even more incredible Bulgarian beach towns, all of which have their own individual bit of history! Traveling the Black Sea Beach Towns of Bulgaria is a great addition to GlobeSlice and anyone’s wanderlust list Love the layout/rollout!